I reviewed this book in November. It absolutely floored me. The writing, the imagination, the creativity, the characters. Excellent book. I should point out that this is NOT YA. 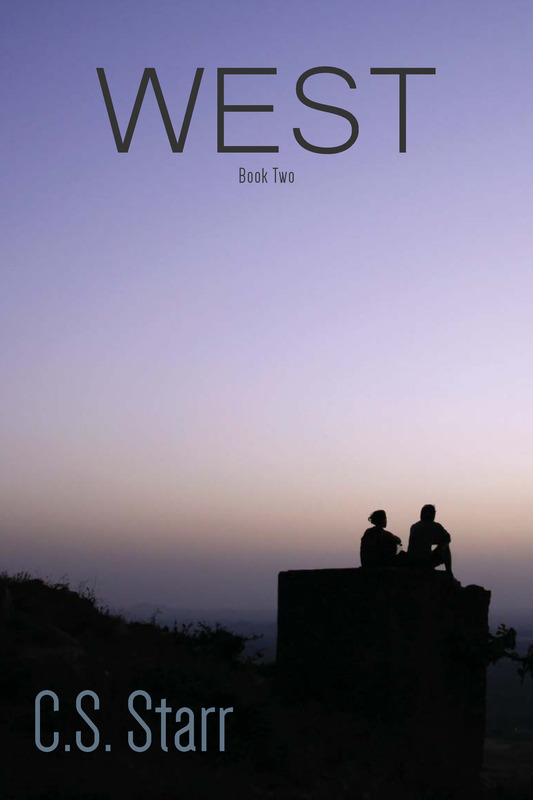 Yes, the characters are young, but the content deals with so much more than the usual YA fare. The author touches on something that everyone can relate to going through in this part of growing up regardless of the world essentially ending. Excellent writing. Back in October, I wrote a post about the Kindle vs. Paper. Click here to read that post. I received my 7″ Kindle Fire HD for Christmas, thank you Daddy. I have had two months to play with it, read on it, download books for it, so I figured it’s time to review. The first day I had my Kindle Fire HD, I was able to pick and choose which books I wanted from my archived book list to go into the carousel. That is the running list of programs, apps and books that you can flip through with a flick of the finger. I quickly downloaded FB, Pinterest, my bank’s app, and Skype. I was able to Skype with my brother and grandparents in Pittsburgh on Christmas night. That just blew my mind. We could have been on a laptop, but the Kindle allowed me to set it up for my six year old who was showing off her loot from Santa. The looks on the faces of my grandparents was worth the cost alone. I occasionally have issues with FB loading, but I think that is an inherit flaw to the FB app. But I have been able to use the Kindle like a laptop with the exception of typing, and like my Android phone. It also uses the same “swype” keyboard that I’m used to with my Android. 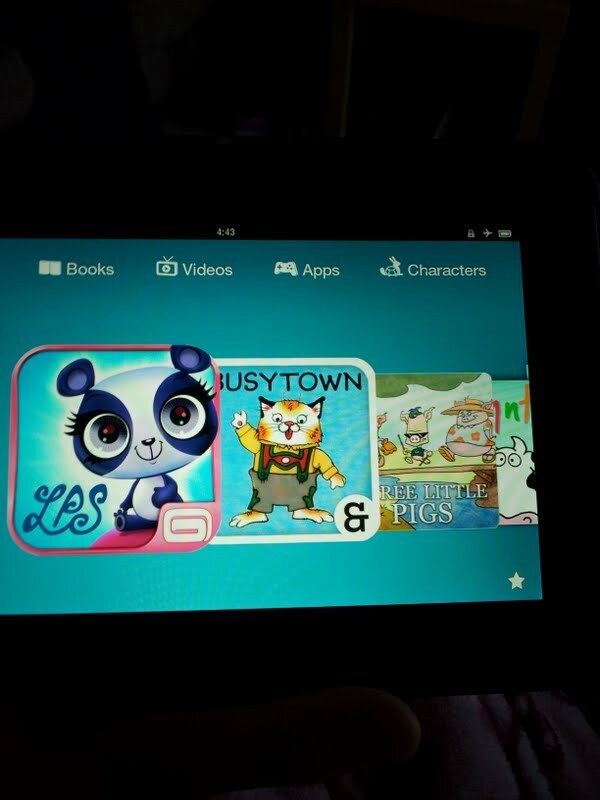 The biggest change I have noticed with the Kindle Fire HD is that my daughter loves it. I subscribe to “Kindle Free Time” which is a service that allows my daughter to read books, play games, watch videos, etc. Its only a couple bucks a month, and it is well worth the cash. The thing I really like about this feature is that it creates a separate user profile for her in which I can control what she has access to and how long she is playing on it. Because she is six, I did not give her permission to the web. At all. There also is a separate code that needs to be typed in when she attempts to buy things online. That soon proved to be a problem with her downloading apps without permission on my Dad’s iPad. I can also buy books for her on Amazon and add those books to her carousel only, and I don’t have to wade through a ton of kiddie books to find what I need. She loves it. I mean, really loves it. It took her no time at all to figure out how to get to the stuff she likes. She occasionally complains about the screen time settings. I have a 2 hour per day time limit on it, along with settings on how much time can be used on apps, and how much time can be spent on videos, reading is unlimited. She blew my mind the other day when she figured out how to get the books to read TO her. The words light up as they are read. Although I like to read her books, this is just another way for her to hear the words and see the proper spellings. For me, the best thing has honestly been that I can read in different fonts, colors and styles. I no longer need a light for my Kindle because when it is in the “black” setting, the words are white and the background is black. Not a lot of light is generated, and my husband isn’t complaining about my little LED light that I used to read at night with my older Kindle. In addition, I can change the font size , just like on an older Kindle, but I can also change the text font. This is of tremendous value to someone who has severe eye problems. I have watched videos and Netflix and I have had no problems at all with buffering or it starting and stopping the video over and over again. I have shopped on it, even for more than books, and again, no problems. The only complaint, is that I have to charge it everyday. I could go a week or so on my old Kindle without recharging. But I understand that to be in full, glorious color, and to run the apps that it runs, it uses up a ton of battery. 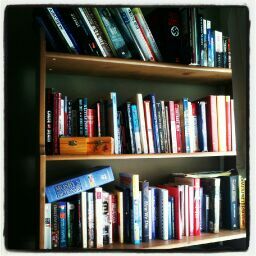 Another issue is the fact that I can’t categorize my books. I frequently “book hunt” and buy several books at a time, mostly self published and usually free. On my previous model, I had several categories of books, and I would assign the new books by category so I would have a clue later on as to what I purchased. 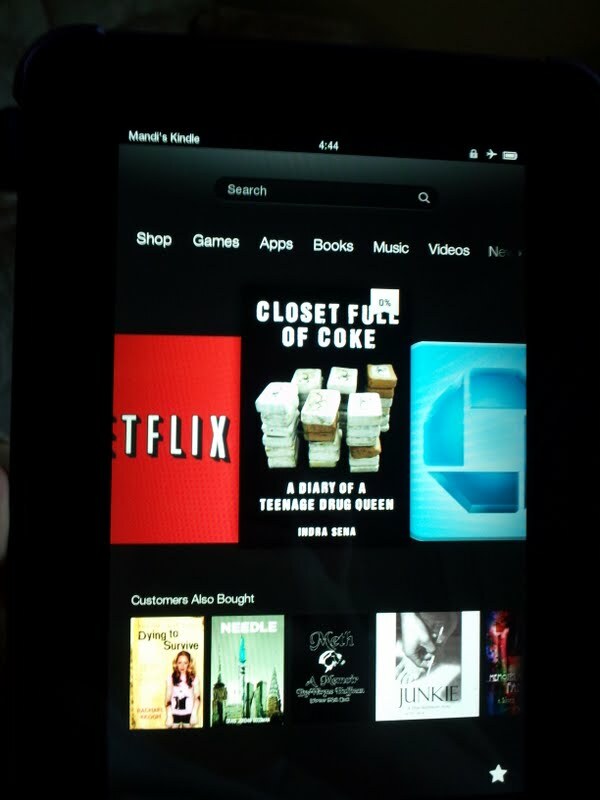 With the Kindle Fire HD, everything is listed on the bookshelf, and they can be chosen from the “cloud” and downloaded to the device one book at a time, usually in less than a minute. All of the books downloaded can show up in the carousel, and sometimes I have to wade through books to find one that I downloaded awhile ago, and want to read now. I can remove the book from the carousel when I am done reading it, but with my reading habits, this isn’t really ideal. I have also been able to put books not bought on Amazon on to my Kindle Fire HD, but it is a bit more tricky than with the old USB to device route. I had difficulty downloading the Windows inputs needed to get it from the laptop to the Kindle Fire HD. But I started emailing the books to my Kindle address, and they pop up, most of them are without the cover art, a few minutes later. Because I read from Smashwords in addition to authors sending me books for review, I was glad to finally be able to figure this one out. My Kindle now goes with me everywhere. And even though I don’t always have internet access when I leave the house, I’m kind of glad it is not like an iPad that is tied to a data plan. Probably saves me more money in the long run and my daughter is “forced” to read books when we aren’t home. Overall, immensely pleased with my Kindle HD, just like I knew I would be. WANTED: Books for review. I am looking for any books to read and review to post on this site. I am currently in a book drought. 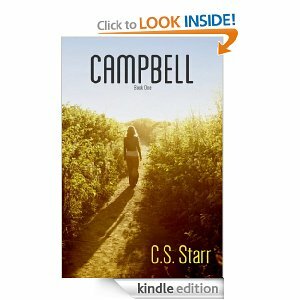 I have started and stopped several books that failed to captivate me and keep me interested. If you are a self published writer, a publisher, or just an avid reader like me, please send me ideas or books or something. As per this site, I read almost anything. I do have rules that I try to abide by, you can read them here. But if it doesn’t seem like something I will read, my guest blogger might. I love books that I can completely immerse myself in. I love strong characters, believable action. I love books that can make me think. Feel free to read through the reviews I have posted so far to get an idea of what I am looking for. I read very quickly and I have ample free time and I usually read 2-3 books a week. I am prompt with reviews and willing to post to any book sites (amazon, smashwords, goodreads etc). I read on the kindle platform, as does my guest blogger. Any input or ideas or books would be greatly appreciated. I started blogging in September of last year. I have a chronic health condition and have been out of work on medical leave since August. Before that time, I was obviously an avid reader, but since I have time periods where I am confined to bed, I have had a lot of time to read. from the bestsellers list (can’t afford to) and most of the books I devour can be found either free (for a limited time) or under $5. Through this method of book hunting, I have found some amazing books that aren’t “mainstream”. Most of these books are self published. And recently some of the authors have contacted me to let me know that my reviews are appreciated. I love hearing from authors. It is nice to know that someone is reading my blog. I finally created a FB page for this blog. I have a ton of friends who love reading as much as I do. I just wanted to share the fantastic books I’ve read to a wider group. I can do that more easily with an actual FB page, rather than replying to each book-themed post that pops up in my news feed. And one of my fellow bibliophiles wants to start contributing. Awesome. If you are an author and you would like me to take a peek at your book, please message me on FB. I read primarily on the Kindle HD and I am usually a fast reader. Also, I have severe lack of funds, so any “gifts” from Amazon or books sent in a pdf file are appreciated. If you are a bibliophile like me and you think I would enjoy a book that you just read, send me a message. With the advent of self-publishing, more people are able to get their books out, especially ones that don’t fit into a particular mode. And as the name says, I have eclectic tastes. And I read all.